If it were up to the likes of Morgan County Commissioner Bob Ford, we’d have a Wal-Mart at the north end of the county, a second Dollar General store in a rural residential neighborhood across from Union Chapel United Methodist Church and Cacapon State Park at the south end of the county and fast food joints in between. And the Morgan County Planning Commission would let them do it. Communities around the country are fighting back against this kind of big city corporate takeover of their rural communities. Just last month, for example, the planning commission in Lake County, California unanimously voted down the application by Dollar General to establish a store in Kelseyville. Dollar General has appealed that decision to the Lake County board of supervisors. 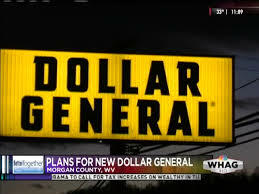 Dollar General already has 12,000 stores around the country — and has stated its intention of opening 600 new stores this year. Here in Morgan County, there is a growing grassroots movement to preserve the rural residential nature of the county. The residents want Judge Christopher Wilkes to overturn the planning commission’s decision. An order issued by Judge Wilkes indicates that the briefing in the case should be completed by mid-August.